Beaver Gulf is to build 258 townhouses in Sama enclave at Town Square. 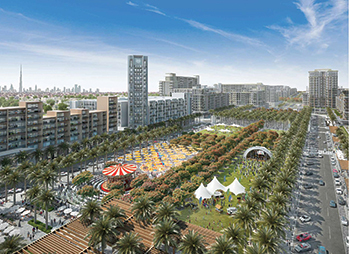 Beaver Gulf, a turnkey contractor with full-fledged in-house divisions for civil construction, oil and gas, engineering, procurement, construction and commissioning (EPCC), electro-mechanical, air-conditioning and structural steel, has won a major contract to build townhouses at Nshama’s Town Square project in Dubai, UAE. Nshama offers trendy, dynamic and sustainable communities with a range of modern amenities and top-class facilities management and lifestyle features. Sama is the sixth phase of townhouses launched within the Town Square project, all of which have been awarded to Beaver Gulf. A fusion of modern living for residents with a contemporary lifestyle, Sama is an enclave of 258 townhouses featuring three- and four-bedroom units, says Beaver Gulf. Sama boasts world-class features and amenities including lush green parks, health centres, best-in-class shopping and retail stores, dining and hospitality services, schools, and a lot more. The three-bedroom townhouses are available for a starting price of Dh1.19 million ($323,633), it states. Town Square has several residential neighbourhoods currently in different stages of completion. The entire project is anchored by the Town Square Park, the size of 11 football fields, and will feature a Vida Townsquare hotel and a Reel Cinemas cineplex, it adds. A joint venture between Spain’s Técnicas Reunidas and UAE-based Target Engineering Construction has been awarded a contract by Adnoc Gas Processing to execute a project to develop gas production facilities at a cost of up to $1 billion, said a report. The project will add 200 million to 400 million cu ft of gas to the daily production of Habshan offshore fields, reported Meed magazine. Adnoc Gas Processing is planning to launch a design contest for two gas extraction projects, it added. 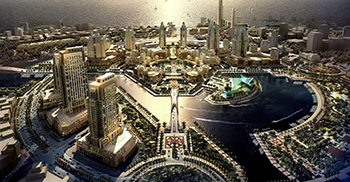 Creet Contracting to undertake infrastructure work at KAEC. King Abdullah Economic City (KAEC), the largest privately-funded new city in the world, has awarded a SR32.8 million ($8.74 million) contract to Creet Contracting Company for development of necessary infrastructure over a sprawling 836,000-sq-m area within the development. The Jeddah-based Creet Contracting undertakes industrial, high-end commercial, residential complex, hotels and electromechanical projects covering development, feasibility, design, engineering, project management to the execution and turnkey handing over. The scope of work includes construction of roads/highways; stormwater drainage network and electrical power infrastructure besides potable/irrigation and fire-fighting water and sewage network; treated sewage effluent and the telecommunications network, says master developer Emaar, The Economic City (EEC). A Tadawul-listed real estate development and management company, EEC’s focus is on the planning and development of KAEC, it adds. Abu Dhabi-based National Petroleum Construction Company (NPCC) has been handed a prestigious award in recognition of its practices and achievements in helping its staff/customers/clients/contractors get home safely at the end of the working day. NPCC has achieved a Gold Medal (five consecutive Golds) in the internationally-renowned RoSPA Health and Safety Awards, the longest-running industry awards scheme in the United Kingdom, says the company.